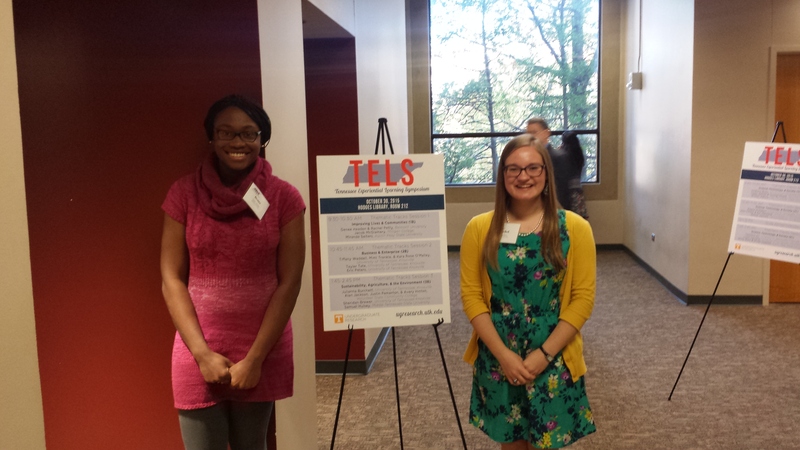 President of Belmont Volunteers for Literacy (BVL) and senior marketing major Denee Headen and Vice-President of BVL and sophomore English major Rachel Petty recently presented at the First Annual Tennessee Experiential Learning Symposium at the University of Tennessee at Knoxville. Their presentation focused on the organization’s efforts to promote literacy and literacy awareness in the Nashville community through programs like Belmont’s annual Family Literacy Day and elementary school poetry contest. Emphasis was placed on how curricular and co-curricular aspects come together to provide learning and service opportunities for students. The Learning Symposium, whose inaugural planning committee included Belmont Provost Dr. Thomas Burns, seeks to show what can happen when high-impact educational practices like service-learning, undergraduate research and global learning come together. Students from 14 Tennessee colleges and universities presented at the event.